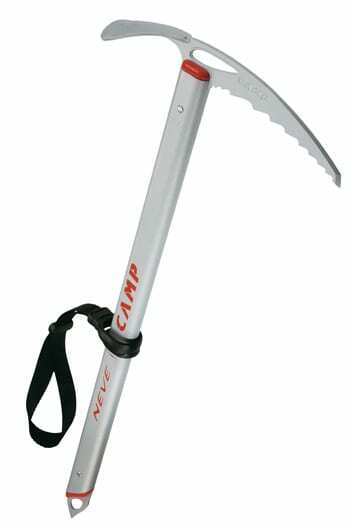 If you are looking for a pretty good general purpose ice axe that offers really exceptional value then look no further than the Camp Neve. This is a really simple, yet well made ice axe with a steel pick and adze, a decent steel spike and a package that doesn’t weigh too much and that doesn’t cost too much either. This axe has a straight shaft and a reasonably moderate pick. This makes it more of an all-rounder mountaineering ice axe than a specialist climbing tool. It also comes in enough lengths that you can find one to fit you or, importantly, one to fit your style. They go all the way up to 80cm for walking, and down to 50cm for more aggressive work on steep slopes. The shaft is B-rated (not T-rated) so is best for less technical climbing (for more on shaft ratings read the beginners’ guide to ice axes). It is not the very lightest out there, but is reasonable at 420g (for the 50cm axe). Its lighter little brother, the Camp Corsa, comes in at about half this weight, but at the expense of some measure of ease of use. It lacks some of the oomph of the other axes, and it would benefit from a rubber grip but overall the Neve is ideal if you need a lightweight basic axe for walking and only occasional ventures onto the steeper stuff. It’s well up to tackling snowy ascents in Snowdonia and the Lakes and winter Munro-bashing in the Scottish winter.